President Barack Obama on Saturday named Charles F. Bolden to lead NASA space agency. Bolden has a long history with the agency. A former shuttle commander, assistant deputy administrator and Deputy Administrator. Bolden flew in space four times, twice as shuttle commander. If the Senate confirms Bolden, he would be the space agency's first black administrator and the second astronaut to hold the post. Charles F. Bolden, Jr. Brig. General, USMC. Born August 19, 1946, in Columbia, South Carolina. 1964 received a bachelor of science degree in electrical science from the United States Naval Academy in 1968, and a master of science in systems management from the University of Southern California in 1977. Bolden accepted a commission as a second lieutenant in the U.S. Marine Corps following graduation from the United States Naval Academy in 1968. He underwent flight training at Pensacola, Florida, Meridian, Mississippi, and Kingsville, Texas, before being designated a naval aviator in May 1970. He flew more than 100 sorties into North and South Vietnam, Laos, and Cambodia, in the A-6A Intruder while assigned to VMA(AW)-533 at Nam Phong, Thailand, June 1972 to June 1973. Upon returning to the United States, Bolden began a two-year tour as a Marine Corps selection officer and recruiting officer in Los Angeles, California, followed by three years in various assignments at the Marine Corps Air Station El Toro, California. In June 1979, he graduated from the U.S. Naval Test Pilot School at Patuxent River, Maryland, and was assigned to the Naval Air Test Center's Systems Engineering and Strike Aircraft Test Directorates. While there, he served as an ordnance test pilot and flew numerous test projects in the A-6E, EA-6B, and A-7C/E airplanes. He has logged more than 6,000 hours flying time. Selected by NASA in May 1980, Bolden became an astronaut in August 1981. His technical assignments included: Astronaut Office Safety Officer; Technical Assistant to the Director of Flight Crew Operations; Special Assistant to the Director of the Johnson Space Center; Astronaut Office Liaison to the Safety, Reliability and Quality Assurance Directorates of the Marshall Space Flight Center and the Kennedy Space Center; Chief of the Safety Division at JSC; Lead Astronaut for Vehicle Test and Checkout at the Kennedy Space Center; and Assistant Deputy Administrator, NASA Headquarters. A veteran of four space flights, he has logged over 680 hours in space. Bolden served as pilot on STS-61C and was the mission commander on STS-45 (March 24-April 2, 1992), and STS-60 (Feb. 3-11, 1994). Bolden left NASA and returned to active duty in the U.S. Marine Corps as the Deputy Commandant of Midshipmen at the Naval Academy, Annapolis, Maryland, effective June 27, 1994. Brig. General Bolden is the Assistant Wing Commander, HQ 3rd MAW Miramar, San Diego, California. SPACE FLIGHT EXPERIENCE: STS-61C Space Shuttle Columbia. During the six-day flight crew members deployed the SATCOM KU satellite and conducted experiments in astrophysics and materials processing. 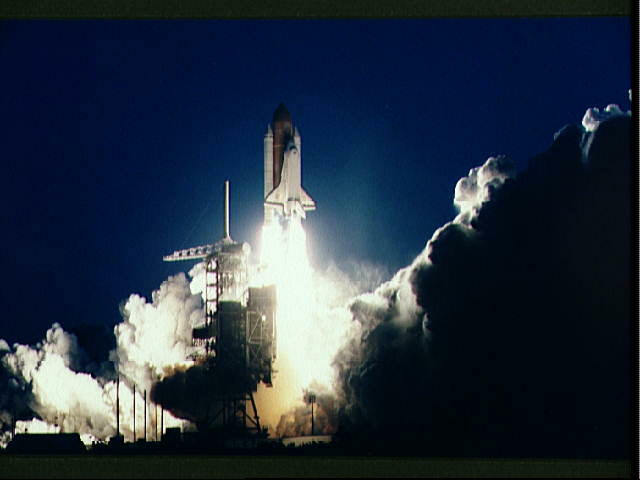 STS-61C launched from the Kennedy Space Center, Florida, on January 12. The mission was accomplished in 96 orbits of Earth, ending with a successful night landing at Edwards Air Force Base, California, on January 18, 1986. STS-31 Space Shuttle Discovery. Launched on April 24, 1990, from the Kennedy Space Center in Florida. During the five-day mission, crew members deployed the Hubble Space Telescope and conducted a variety of middeck experiments. They also used a variety of cameras, including both the IMAX in cabin and cargo bay cameras, for Earth observations from their record-setting altitude over 400 miles. Following 75 orbits of Earth in 121 hours, STS-31 Discovery landed at Edwards Air Force Base, California, on April 29, 1990. 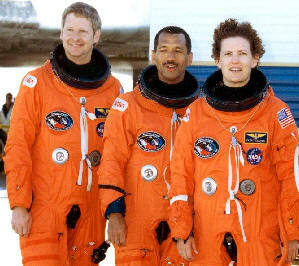 On STS-45 Bolden commanded a crew of seven aboard Space Shuttle Atlantis. Launched on March 24 from the Kennedy Space Center in Florida, STS-45 was the first Spacelab mission dedicated to NASA's Mission to Planet Earth. During the nine-day mission, the crew operated the twelve experiments that constituted the ATLAS-1 (Atmospheric Laboratory for Applications and Science) cargo. ATLAS-1 obtained a vast array of detailed measurements of atmospheric chemical and physical properties, which contribute significantly to improving our understanding of our climate and atmosphere. In addition, this was the first time an artificial beam of electrons was used to stimulate a man-made auroral discharge. 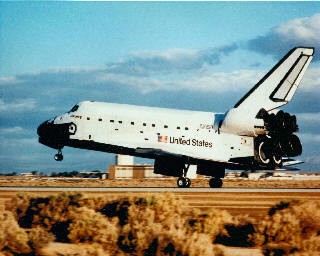 Following 143 orbits of Earth, STS-45 Atlantis landed at the Kennedy Space Center, Florida, on April 2, 1992. On STS-60 he commanded a crew of six aboard Space Shuttle Discovery. This was the historic first joint U.S./Russian Space Shuttle mission involving the participation of a Russian Cosmonaut as a mission specialist crew member. The flight launched on February 3, 1994, from the Kennedy Space Center, Florida, and carried the Space Habitation Module-2 (Spacehab-2), and the Wake Shield Facility-01 (WSF-1). Additionally, the crew conducted a series of joint U.S./Russian science activities. The mission achieved 130 orbits of the Earth, ending with a landing on February 11, 1994, at the Kennedy Space Center, Florida. SPECIAL HONORS: Recipient of the Distinguished Flying Cross, the Defense Superior Service Medal, the Defense Meritorious Service Medal, the Air Medal, the Strike/Flight Medal (8th award), Honorary Doctor of Science Degree from the University of South Carolina (1984), Honorary Doctor of Humane Letters from Winthrop College (1986), the NASA Outstanding Leadership Medal (1992), NASA Exceptional Service Medals (1988, 1989, 1991), the University of Southern California Alumni Award of Merit (1989), and an Honorary Doctor of Humane Letters from Johnson C. Smith University (1990).